Sammartini junior – he was some five years younger than his brother Giuseppe, who largely made his reputation in London – has had less than entirely fair treatment from historians. Look him up and a certain way of perceiving him, which sounds admiring but is actually a way of not taking his music altogether seriously, is almost universal. A few representative quotations - “Sammartini’s music played a fundamental role in the formation of the classical style”; “He was one of the most influential figures in the early development of the symphony, beginning in something like the baroque manner of Vivaldi, but going on to develop a style which is the apotheosis of the grace and elegance of the galant style”; “He was much respected as a teacher. Quantz made a point of visiting him; he had a profound influence on Johann Christian Bach and Glück was his pupil”. Haydn famously described Sammartini as “a scribbler”, but it is not uncommon for an artist to rubbish one of his major influences – to listen to Sammartini’s sinfonias is to hear unmistakeable anticipations of Haydn – if only so that one’s own ‘originality’ might not be doubted. But all this talk of influence means that Sammartini has, in effect, been neatly pigeon-holed as “a transitional figure” – a status which is usually the kiss of death. To be a transitional figure is, by implication, to be neither one thing nor the other, to matter primarily, not for one’s own work but for what others made of it; for an artist to be categorised as “a transitional figure” is usually a sure guarantee that his work won’t actually be looked at for its own sake. Sammartini was the most important composer in Milan for much of his mature life. His best music deserves attention for its own merits, not just for what other later composers might have learned from it. The best of it is very fine indeed. His output includes three operas, a considerable body of chamber music, much of it very striking, violin concertos and some delightful sinfonias; since he was maestro di capella for several of Milan’s major churches, holding a number of such posts simultaneously, he also wrote a good deal of sacred music. Only in recent years has Sammartini’s religious music attracted any real attention. The foundation for such study was laid by the 1979 catalogue of his work, prepared by Bathia Churgin and Newell Jenkins. 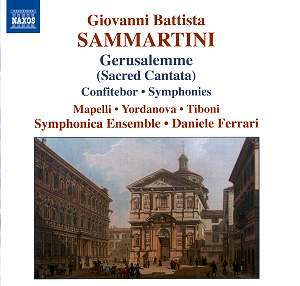 There are two important essays on the sacred music, by Marina Vaccarini Gallarani and Charles R. Verble, in the 2004 publication Giovanni Battista Sammartini and his musical environment, edited by Anna Cattoretti. This the fourth in a series from Naxos devoted to Sammartini’s sacred music (and some symphonies). The recordings of the sacred music are premiere recordings. The previous volumes – Naxos 8.557431, 8.557432 and 8.570254 – all by basically the same forces, directed by Daniele Ferrari, have had a mixed reception. They have been generally well received in the Italian musical press, but this has not always been so elsewhere. The division of opinion is well represented on the pages of MusicWeb International, in the views of Jonathan Woolf and Patrick Waller. It is perhaps appropriate, therefore, that my reaction to this latest volume is rather mixed. There is some fine music here. The main work, Gerusalemme sconoscente ingrata is one of a series of Lenten cantatas which Sammartini wrote for the very handsome Jesuit church of San Fedele in Milan, designed by Pellegrini in the 1570s to a commission by Carlo Borromeo, where there met the grandly titled Congregation of the Most Holy Sepulchre of Our Lord Jesus Christ and the Solitude of the Most Holy Sorrowing Virgin, a predominantly lay association fully appreciative of the quasi-operatic nature of Sammartini’s cantatas. The cantatas following a common pattern, beginning with an orchestral introduction, followed by a series (usually three) of recitatives and paired arias, closing with a vocal trio. Many of the arias would not have been out of place in the works Sammartini wrote for the Royal Ducal Theatre in Milan (predecessor of La Scala). There is, for example, some beautifully expressive writing in the soprano aria ‘Quel Serto, quell Manto’ and considerable dramatic power in the mezzo aria ‘Lupo crudel rapace’. Both of the symphonies which close the disc are attractive pieces, that in E flat made up of two fast movements, that in G minor of three movements (allegro-andante-presto), the central slow movement of which has both gravity and charm. Only some twenty sacred works by Sammartini are known at present. The quality of what survives – at least the best of it – is such that I, for one, hope that more will be rediscovered. I am very grateful to Naxos for this very interesting series. Yet it has to be said that the performances are not, consistently, of the very highest standard. The orchestral playing is generally sound, but not always as crisp or precise as one might wish. Happily, the solo violin contribution to Gerusalemme sconoscente ingrata is very pleasantly played by Stefano Lo Re. The soloists all have operatic experience, a relevant consideration in this music. Silvia Mapelli (Maria Maddelena) copes pretty well with the technical demands of her part, but her voice lacks variety of tone, which limits her expressiveness; Miroslava Yordanova (Mary Cleophas) – who some may remember as a contestant in the Cardiff Singer of the World Competition in 2001 – sings with power and authority, though perhaps not always with the greatest subtlety; Giorgio Tiboni has an attractive, but decidedly light, tenor voice, which sometimes sounds a bit lacking in impact in this context. Certainly the contrast between his relatively slight voice and the weight of Yordanova’s voice makes this a somewhat ill-matched team. But such reservations shouldn’t detract from a genuinely warm welcome for the latest issue in an interesting, enjoyable – and important – series, even if, finally, one finds oneself feeling that these recordings are good enough to make one imagine how splendid the music might sound in even better performances, rather than fully satisfying in themselves.